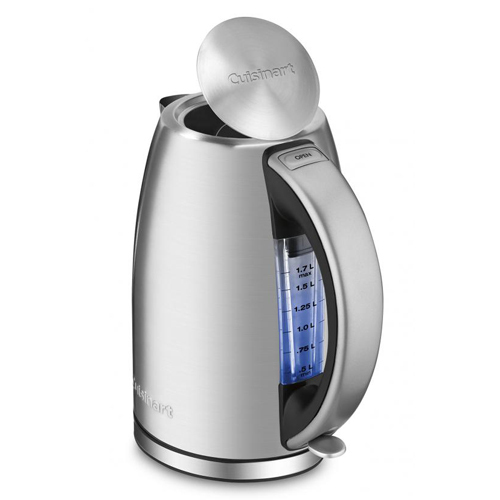 The Cuisinart JK-17 is a 1500 watts cordless tea kettle which helps making hot beverages easily. This kettle is exceptionally easy to use because of a simple On/Off control and an Open button that lifts the lid. It has blue backlit water window, non-slip handle and Easy to open lid. The Cordless Electric Kettle has many exciting features for users of all types. You can extend the lifetime of your Cordless Electric Kettle with the purchase of a FactoryOutletStore Factory Protection Plan. See the Cordless Electric Kettle gallery images above for more product views. The Cordless Electric Kettle is sold as a Brand New Unopened Item.